Nicholas Thomas "Nick" Swisher (born November 25, 1980) is an American professional baseball right fielder and first baseman who is currently a free agent. He is a switch hitter who throws left-handed, and has played in Major League Baseball (MLB) for the Oakland Athletics, Chicago White Sox, New York Yankees, Cleveland Indians, and Atlanta Braves. He won the 2009 World Series with the Yankees against the Philadelphia Phillies and was an All-Star in 2010. Swisher is the son of former MLB catcher Steve Swisher, who played for various National League baseball clubs in the 1970s and 1980s. 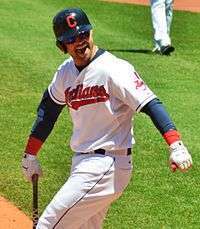 Swisher was born in Columbus, Ohio, but grew up in Parkersburg, West Virginia. Before his professional career, Swisher played college baseball for the Ohio State Buckeyes. 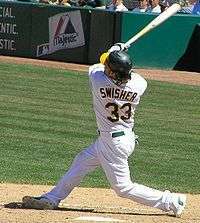 Drafted by the A's in the 2002 MLB draft, Swisher made his MLB debut with the Athletics in 2004, and played for the team through 2007. 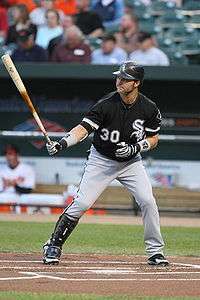 After spending one year with the White Sox in 2008, the Yankees acquired him prior to the start of the 2009 campaign. He played in New York for four years before signing with the Cleveland Indians prior to the 2013 season. Swisher was a two-sport star at Parkersburg High School in football and baseball as well as a letterman in basketball. As a strong safety he was recruited by several Division I-A football programs, including University of Notre Dame, but chose to pursue baseball. Swisher was selected by the Oakland Athletics with the Boston Red Sox first round pick in 2002 as compensation for the loss of free agent Johnny Damon. Swisher, and the Athletics' 2002 draft, are heavily featured in Michael Lewis' 2003 book Moneyball. In a book whose key theme is the gulf between orthodox baseball thinking and the new sabermetric influenced system being implemented by Billy Beane, Swisher was notable as one of the few examples of a player who traditional scouts and Beane could agree upon. Swisher made his MLB debut in 2004 for the Athletics, playing in 20 games. Retaining his rookie status for 2005,[lower-alpha 1] Swisher hit 21 home runs and recorded 74 RBI in 131 games for the 2005 Athletics. He finished 6th in the American League Rookie of the Year voting. Teammate Huston Street won the award, while fellow 2002 Oakland draftee Joe Blanton finished seventh. On September 16, 2007, Swisher initiated a brawl when he charged the mound after getting hit by a pitch from Texas Rangers pitcher Vicente Padilla. Earlier in the plate appearance, Padilla (who had hit Swisher the prior year) threw two inside pitches with the apparent intention of hitting Swisher. Both players were ejected following the brawl. Swisher was traded on January 3, 2008 to the Chicago White Sox for minor leaguers Ryan Sweeney, Gio Gonzalez, and Fautino de los Santos as part of what Athletics general manager Billy Beane termed a "rebuilding effort". While Swisher quickly established himself as a fan favorite on his new team he struggled offensively, batting just .219 through the season (the lowest batting average in the majors), though he improved his home run total from 22 in 2007 to 24 in 2008. He also led the majors in pitches per plate appearance, with 4.51. Because of his poor offensive play White Sox manager Ozzie Guillén benched Swisher for most of September, saying publicly that "I have to put the best lineup out there to win the game ... To me, the best lineup right now is without (Swisher)." Swisher finished the 2008 regular season with a .219 batting average, 24 home runs, and 69 RBI. Swisher hit his first postseason home run in the 2009 World Series. He got his first championship title as the Yankees eventually won the World Series against the Philadelphia Phillies in 6 games. During the Bleacher Creatures' roll call at the top of the first inning, Swisher was known to come to attention and salute the bleachers. On December 23, 2012, Swisher agreed to a four-year, $56 million contract with the Cleveland Indians. The contract reportedly included a fifth year vesting option worth $14 million, making the total contract worth $70 million. The deal became official on January 3, 2013. He soon called a section of the stadium Brohio. On April 14, 2016, Swisher signed a minor league contract to return to the Yankees. They assigned him to the Scranton/Wilkes-Barre RailRiders of the Class AAA International League. Playing first base, Swisher batted .255 with seven home runs and 25 RBIs in 55 games. The Yankees opted not to promote Swisher to the major leagues, in spite of injuries suffered by Mark Teixeira, Dustin Ackley, and Chris Parmelee. On July 2, Swisher opted out of his contract to be with his family following the birth of his second daughter. In August 2009, People reported that Swisher was dating actress JoAnna Garcia. Swisher and García became engaged in May 2010, and married on December 11, 2010, at the Breakers Hotel & Resort in Palm Beach, Florida. The couple have two daughters, Emerson Jay Swisher, born on May 21, 2013 and Sailor Stevie Swisher, born on June 28, 2016. Swisher released a children's music album titled "Believe" on August 9, 2011. A percentage of the proceeds will be donated to "Swish's Wishes", a charity started by Swisher for children who are facing health crises. The 12-song album features guest appearances from Bernie Williams and Barry Zito. All of the songs recorded on the album are cover songs that were selected by Swisher. The album peaked at #3 on the chart of iTunes Children's Albums. ↑ Though Swisher debuted with the Athletics in 2004, he qualified as a rookie in 2005, as he had less than 130 at-bats during the 2004 season. ↑ "Lillian Malizia Obituary". The Columbus Dispatch. Retrieved April 18, 2016. ↑ "Passenger Search". Retrieved April 18, 2016. 1 2 3 4 McCarron, Anthony (May 9, 2009). "Swisher Honors Memory of Woman Who Raised Him". New York Daily News. 1 2 "Nick Swisher Has Found Success In His Strut". Sports Illustrated. May 29, 2006. Retrieved November 19, 2009. ↑ Times. "Nick Swisher". The Baseball Cube. Retrieved August 9, 2015. ↑ Lewis, Michael (2003). Moneyball: The Art of Winning an Unfair Game. W.W. Norton & Company Inc. ISBN 0-393-05765-8. ↑ Times (June 21, 2002). "Spokesman.com | Archives". Nl.newsbank.com. Retrieved December 23, 2012. ↑ "Visalia Alumni in MLB All-Star Game | Visalia Rawhide News". Milb.com. Retrieved December 23, 2012. ↑ "NL.Newsbank.com". Retrieved September 7, 2014. ↑ . "Talking baseball with Swisher | MLB.com: News". Mlb.mlb.com. Retrieved December 23, 2012. ↑ "2004 Minor League Batting Leaders". Baseball-Reference.com. Retrieved December 23, 2012. ↑ "MLB Miscellany: Rules, regulations and statistics". MLB Advanced Media. Retrieved June 5, 2012. ↑ "Street wins AL Rookie of Year; Howard wins NL". ESPN.com. Retrieved April 18, 2016. ↑ "A season in the life of Nick Swisher". ESPN.com. Retrieved April 18, 2016. ↑ Rebuilding A's continue dealing – Swisher to White Sox MLB.com. Retrieved January 3, 2008. ↑ "2008 Major League Baseball Advanced Batting". Baseball-Reference.com. Retrieved June 2, 2010. ↑ "2008 Major League Baseball Pitches Batting". Baseball-Reference.com. Retrieved June 2, 2010. ↑ Ex-Buckeye Nick Swisher Is Becoming a Fan Favorite.. Bleacher Report (October 22, 2010). Retrieved on 2010-12-22. ↑ "Yankees acquire 1B/OF Nick Swisher and Kanekoa Texeira from the Chicago White Sox in exchange for INF Wilson Betemit and two Minor League pitchers, 11/13/2008" (Press release). Major League Baseball. November 13, 2008. Retrieved July 22, 2011. ↑ Hoch, Bryan (December 23, 2008). "Yanks feel fortunate to land Teixeira: Move delivers a convincing warning to the American League East". MLB.com. Retrieved June 1, 2010. ↑ Kepner, Tyler (March 23, 2009). "Yankees' Right-Field Competition Ends With Nady as the Winner". New York Times. Retrieved June 1, 2010. ↑ Haft, Chris (January 8, 2009). "Giants, Swisher would be nice match: Yankees could be shopping outfielder after signing Teixeira". MLB.com. Retrieved June 1, 2010. ↑ Kepner, Tyler (January 16, 2009). "Yankees Hearing Offers for Swisher and Nady". New York Times. Retrieved June 1, 2010. ↑ Feinsand, Mark (April 15, 2010). "Yankees OF Xavier Nady headed to disabled list, could be done for season". New York Daily News. Retrieved June 1, 2010. ↑ "MLB – New York Yankees/Tampa Bay Rays Box Score Monday April 13, 2009 – Yahoo! Sports". Sports.yahoo.com. April 13, 2009. Retrieved June 2, 2010. ↑ "New York Yankees vs. Tampa Bay Rays – Preview – April 14, 2009 – ESPN". Sports.espn.go.com. April 14, 2009. Retrieved June 2, 2010. ↑ Nick Swisher's offense is now in full swing. NorthJersey.com. Retrieved on December 22, 2010. ↑ "Nick Swisher Statistics and History". Baseball-Reference.com. Retrieved July 22, 2011. ↑ Boland, Erik (November 9, 2012). "Nick Swisher, Rafael Soriano and Hiroki Kuroda decline Yankees' qualifying offers". Newsday. Retrieved November 10, 2012. ↑ "Indians, Nick Swisher agree to deal". December 23, 2012. Retrieved December 23, 2012. ↑ "Nick Swisher says he's going through "uncharted waters' this season with Cleveland Indians". June 30, 2014. Retrieved July 10, 2014. ↑ Jason Lukehart (June 14, 2015). "Indians place Nick Swisher on DL with left knee inflammation, or maybe Giambitis". Let's Go Tribe. Retrieved April 18, 2016. ↑ "Indians trade Nick Swisher, Michael Bourn to Atlanta Braves". fox8.com. Retrieved April 18, 2016. 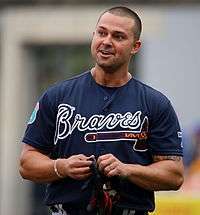 ↑ "Atlanta Braves release former Cleveland Indian Nick Swisher, who is still owed $15 million". cleveland.com. Retrieved April 18, 2016. ↑ "Braves release Nick Swisher". FOX Sports. March 28, 2016. Retrieved March 28, 2016. ↑ Feinsand, Mark (April 13, 2016). "Nick Swisher signs minor-league deal with Yankees". New York Daily News. Retrieved July 2, 2016. ↑ Feinsand, Mark (July 2, 2016). "Family first as Nick Swisher opts out of his Yankees minor-league deal, not ruling out a return next season". New York Daily News. Retrieved July 2, 2016. ↑ "BaseballReference.com". Retrieved September 7, 2014. ↑ "nickswisher.net". "nickswisher.net". Retrieved July 22, 2011. ↑ Marx, Linda (August 12, 2009). "Is Kate Hudson A-Rod's Good Luck Charm? – Couples, Alex Rodriguez, Kate Hudson". People.com. Retrieved June 2, 2010. ↑ "Privileged's Joanna Garcia and Yankee Nick Swisher Are Engaged". People. May 28, 2010. Retrieved December 12, 2010. ↑ "Joanna Garcia and Nick Swisher Wed in Palm Beach". People. December 11, 2010. Retrieved December 12, 2010. ↑ "Nick and JoAnna Garcia Swisher Welcome a Daughter". People. May 22, 2013. Retrieved May 22, 2013. ↑ "Nick and JoAnna Garcia Swisher Welcome Daughter Emerson Jay". People. Retrieved May 23, 2013. ↑ "Nick and JoAnna Garcia Swisher Welcome Daughter Sailor Stevie". People. July 1, 2016. Retrieved July 3, 2016. ↑ "Video: Does JoAnna Garcia's NY Yankee Husband Hit a Home Run on Better With You?". TVLine.com. February 13, 2011. Retrieved February 19, 2011. ↑ Snyder, Whitney (February 17, 2010). "Nick Swisher On 'How I Met Your Mother' (VIDEO)". Huffingtonpost.com. Retrieved June 2, 2010. ↑ "'Believe' It: Yankees Slugger Nick Swisher Releases Children's Album". Associated Press. August 4, 2011. Retrieved August 9, 2015.